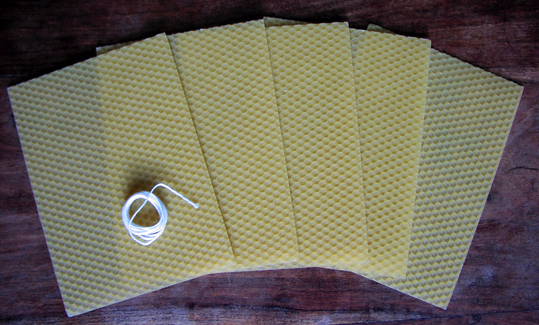 How about making yourself some lovely beeswax candles to put on your altar? 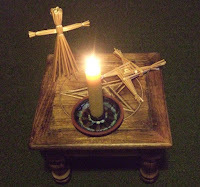 It is a particularly appropriate craft for this time of year because Candlemas Day, on February 2, was traditionally when candles were made and blessed. 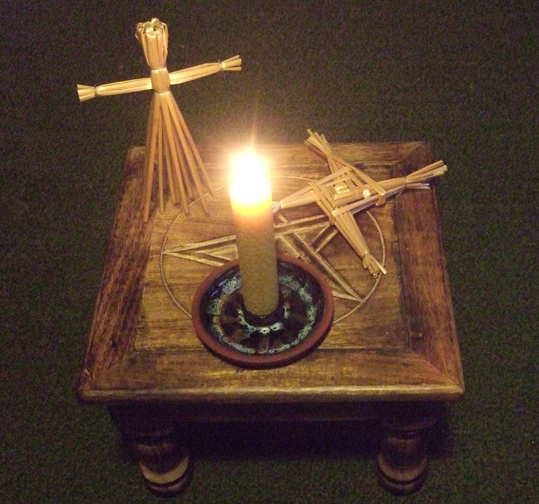 Pagans also often like to burn candles to celebrate Imbolc, on February 1, to symbolise the first signs of spring returning to the land. To make a candle, you can simply place a wick on one end of the wax sheet, then roll it up into a neat tube around the wick. Do leave a little of the wick poking out of the end though, so you can actually light the candle. 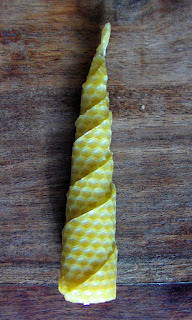 Fold a little wax on the tip of the wick to prime it before lighting it to help it burn smoothly. 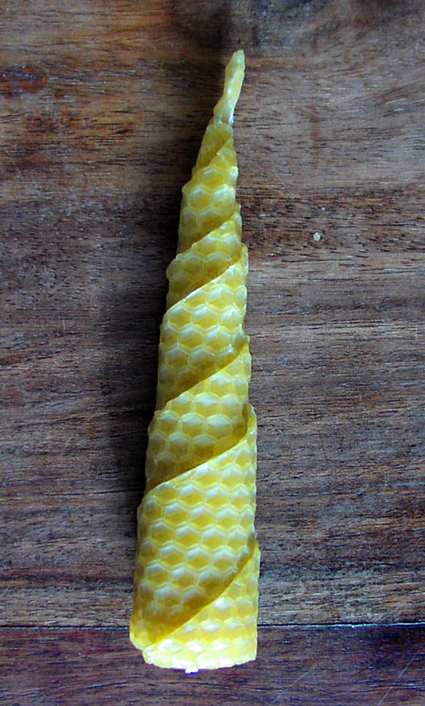 If you fancy a candle that's a little bit more decorative, cut your beeswax sheet diagonally across so that you make two triangles, with one triangle slightly smaller than the other. Lay the smaller triangle over the bigger triangle. Put the wick along one edge with a bit poking out of the top. Roll the two triangles up around the wick so you get a conical candle with a spiral pattern like the one in the photo to the right. Again, prime the top of the wick with a tiny bit of wax by folding a little around it. Make sure the bottom of your candle is completely flat so that it stands up properly. Put it in a suitable fireproof container or candle holder before lighting it. You can find out a lot more about candle spells and rituals in my book Pagan Portals - Candle Magic: A Witch's Guide to Spells and Rituals.